This is a 20" piece with beads that hang another 4+ inches from the chain in the center. It is made up of multi-linked black chain with turquoise satin cord running through. 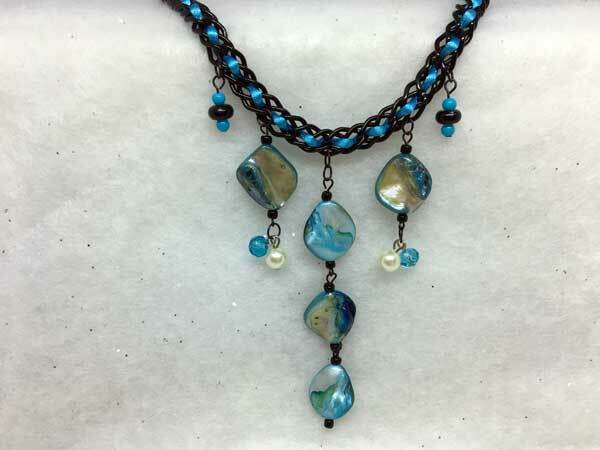 Hanging from the chain are a combination of coordinating beads with large shell pieces, fully-faceted glass rondelles, pearl beads, black rondelles and seeds,and some small turquoise rounds. The center shells hang separately for extra movement and shine. All of the shell pieces have beautifully variegated color from dark grey, to blue turquoise to ivory pearl. A very lovely and unique piece that will get you lots of compliments every time that you wear it.